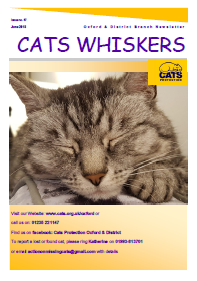 Oxfordshire Cats Protection produces a quarterly newsletter, “Cat’s Whiskers”, about rehoming successes, event reports, news from the branch and so on. Regular items include reports from the Welfare and Homing officers, cat cabin holders, events held and a list of ones coming along. You can read a sample article below. A year’s subscription costs £10, and can be given as a gift. If you would like to subscribe, please complete the form linked above. The June issue features a report on hyperthyroidism, as well as reports from our welfare officer, and some of the cats and kittens we have homed.